1. You paddled across a lake to get to your favorite Brook Trout pond and have had an outstanding day fishing. Its 5 pm in the afternoon, and you put in to paddle across the lake (that you paddled across in the morning). Over the ensuing hours, a stiff wind has come up. How do you handle crossing the lake (in regards to potentially getting swamped)? 2. I'll likely purchase the carrying yoke for my external frame pack (Its an older Camp Trails Sierra in surprisingly excellent condition). 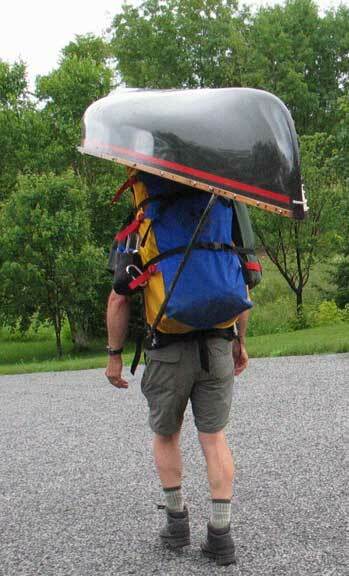 Question is what sort of distances is it needed for vs. carrying the canoe on your shoulder? The boat I'm buying is a 12 foot, high-profile, Classic. Batten down your vest straps, stick to the leeward side of the lake/islands, stay near shore, and be glad you bought the high-profile. I'm an owner of a Placid Boatworks 12' Spitfire and my fishing partner has a 12' Hornbeck Blackjack. I've never taken on water in high winds (yet)... but he has. Oh, and always be gear prepared for the possibility to have to spend the night. 1) Go right at the waves. The boat will cut right through them. It will be second nature to you in no time. The boat is surprisingly stable because you are sitting directly on the hull thus lowering your center of gravity. 2) One mile or less I'll carry on my shoulder like a shield. Greater distances I'll carry it on my shoulders which is most of the time. Lesson learned - Learn to sit into the boat from both sides. I enter the boat from the left side then swing my legs over the port 99% of the time. The one time I needed to enter on the starboard I almost flipped it due to the fact I had no muscle memory and I got cocky. My fishing partner got quite the laugh. Sometimes you don't get to chose what side to enter in the Adirondacks depending on your campsite and surrounding topography. Make sure you oil the wood once a year. Hornbeck will give you the oil. I suggest a bottle of 303 Protectant to clean the hull occasionally too. Enjoy your Hornbeck! I also have a 12' classic. I think it has a mid-depth hull. There's rarely a weekend when I don't take it out. Take the waves with lightweight bow and stern. I kept all my gear weight centered as much as possible. The bow will bob up over waves instead of cutting through if you can center the weight. Approach big waves at a 45 degree angle if possible, especially those caused by motor boats. Since the center thwart in my classic design Hornbeck is not balanced with the boat, I made a bolt-in carry yoke that is quick and easy to install and remove. It rests on a yoke carrier on the top of my external frame backpack and also a aluminum rod attaches to the bottom of the backpack, making a riigid triangular mount that securely carries the canoe. If I am carrying to a remote pond, I don't much do it by throwing the boat over my shoulder. I use my yoke instead. Pete does sell a simple carry yoke, by the way. A friend of mine just bought Pete's fishing outfit model Hornbeck, complete with oars so that he can more easily fish from the boat. I used pool noodles rolled into the ends, with a wood dowel to stiffen the one in front. The rear cover is custom fit to my knupak backpack. How do they attach to the boat? Huge fan of Hornbecks...you will LOVE yours. Good advice already. Have seen the carrying yoke he sells and it worked great. Good one Pikebuster! Lows can be a real bear when windy. Lake Lila too. Look carefully and you will see snaps in the gunwale. On other large boats meant for Yukon racing we use wide Velcro strips glued in place. I will be on Lows all this week training adult guides for BSA, but in a RapidFire instead, for which I also have a spray cover. Depends on the size & shape of the lake. If possible I stay on the sheltered side, but if it's a long body of water with the wind oriented along it, that doesn't work. Whether sheltered or not, when it's iffy I stay near shore if possible. Along with keeping the correct angle to the waves, if I'm near the limit of what I can do, I find it helps to give a strong pull with the paddle to help me up & over. And ditto the comment that it's good to have food & supplies to wait it out, just in case. One advantage of the Hornbeck (I have a blackjack 10) is the ease even of bushwhacking. One time I bushwhacked along a lake when I wasn't comfortable with the waves. But that wouldn't work if it was a long way (that time was about a mile). Be aware a lot of pack boats save weight by not having flotation chambers. I would not lash gear. Agree with other comments and would add that the trim of the craft will potentially help. Heading into a wind, you would like the craft to be SLIGHTLY trimmed bow heavy. Not dramatically (that would raise the risk of having a wave break over the bow) but a slight stern-high/bow-low trim will keep the wind from catching the bow and blowing you sideways among the waves. If it is really bad, pull over and wait it out. A bow-high trimmed craft will act like a sail in the wind and be quite difficult to keep pointed into the wind (continually swinging sharply to the sides when blown). Being used to full sized canoes with various shaped bottoms, when I first got my 10' 6" pack boat it felt a little "twitchy". Matter of fact the farther from shore and larger the waves the"twitchier" it got. I decided it would be a good idea to know at just what point this thing was going over. I experimented in chest deep water and discovered you really have to work to get it to capsize. I mean like 4 serious tries. All the twitchiness disappeared. I might swamp it someday (next warm water sea trial) but barring an entry or exit oops I don't think I'd ever be on the water in conditions that could cause an upset. Hi, Beartooth -- amazing how much good info we can get from Forum members! We have two classic Hornbecks and have had them out in lots of tough conditions. The wind is not much of an issue and we've done many trips, including on Lake George and on Little Tupper. On Lake George, we are much more mindful of big power boats than of big waves (we stay close enough to shore, wear our PFDs, and avoid high traffic areas). If a big wave is approaching, I just make sure I am to raise both blades of the paddle out of the water and wait to bob over the top. A tippy test is always a good idea, ahead of time, to see how you and the boat both behave in that type of situation -- good suggestion, aft paddle. Rather than wind and waves, the biggest problems we ever had in the Hornbecks was trying to get to shore in Adirondack mud. Slop in has never been an issue except when the boat was loaded with containers of freshwater weighing 200 lbs but you don't want to get broadside to the waves in any case. 2) Use good judgement - if there are rollers and whitecaps, do not take a chance; especially if the wind is coming down the lake and you are going across with the waves hitting you from the side. 3) Wait out the wind for a few hours; in most cases as darkness approaches and the sun goes down, so will the wind. 4) as said previously; if you are able, and it's not too bad, paddle in the direction of the waves and/or skirt the shoreline. You will love your new Hornbeck, but remember - this is supposed to be fun. Be smart and make sure you do not take unnecessary risks. I don't care what kind of canoe or kayak you have; certain conditions can lead to disaster and things can go sideways real fast and in the blink of an eye you will be in the water. Don't ask me how I know this (I was in a Wilderness Systems kayak when it happened). Have fun paddling and fishing. I had a Lost Pond Boat but sold it after getting a pair of carbon-fusion Swift kayaks for my wife and I. I sometimes use my wife's 12-footer for pond hopping, but my ADK 13.6 is a great overall boat for me and kayaks obviously take on less water than a canoe. Overall, use common sense. As Cutbait said, avoid whitecaps and rollers and wear the PFD. I've had to result to paddling early morning, or evening to avoid the winds. I'm also an avid weather watcher. Last edited by Buckladd; 06-20-2018 at 09:25 PM.. I have an 11 foot cedar strip solo canoe that weighs about 17 pounds. About 10 years ago I was camping and fishing in the West Canada Wilderness on a long relatively narrow lake. The water was still pretty cold. It was around May 10th. I had fished all day hugging the shore line and drop offs without much for wind. In the afternoon the the weather changed rapidly and I was on the opposite side from my campsite. I decided to make a quick shot across the lake to get back to camp. It was one of the most hair raising short canoe rides I have ever had. I had my PFD on and buckled but as I headed across the white caps seemed to grow and get closer together. I tried to keep a 45 degree angle to the waves but it was very hard to do and they kept coming one after another. I took a few waves that put some water in the bottom but how I managed to avoid getting swamped was beyond belief. When I got to the other side it took a while to settle down. I knew I had dodged a close one and vowed to sit it out in the future if a similar situation ever presents. At least I had a couple of trout to cook up for my Dad for dinner. We will always remember that afternoon ride. That makes me want to experiment with the swimming noodle to split it and wrap it around the gunwales for added flotation and buoyancy. Wldrns maroon skirt looks great as well!